For Egyptian fashion designer Farah El Ashiry, summer is never over. From the inspiration of a wealth of cloth from East Asia to the designs of patterns inspired by the governorates of Egypt, Farah El Ashiry, a 27-year old entrepreneur, has been making her way through the fashion industry in Egypt. The beginning was in the summer of 2014 when Farah, having finished her marketing and communications degree at the American University in Cairo and her fashion design diploma at the Italian Fashion Academy, decided to embark on a life-long dream of launching her own fashion line. 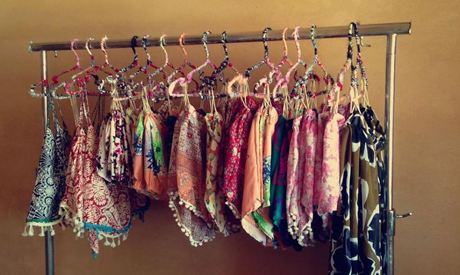 “It was a cachet of glorious fabrics that I found at my grandmother’s who was really well-travelled. She had incredibly beautiful material from Nepal – glorious colours and patterns, and it was summer and the mood of the fabrics was perfect for Sahel (the Northern Egyptian coast), with the area's obvious interest in cache-maillots and shorts,” El Ashiry recalled. In a week of hard work, she managed to produce 40 pieces of beachwear, and with the help of some friends, she managed to produce a basic photo shoot to post her products online under the self-improvised brand of her own nickname, Fufa. “It really was very spontaneous. I went to a friend’s house in Sahel and from there I put the products on display and really in less than a week everything was sold out and I had to work on another set of 70 pieces,” said El Ashiry. Fast and quality production required the recruitment of aides and in less than a year, El Ashiry was moving forward with her nascent fashion project that was slowly but surely gaining ground with a clientele that is essentially made of well-off teenagers and university students. El Ashiry was quickly moving her sewing machine, her fabrics, threads and needles from the living room of her parent's house to a small studio where she was working with two assistants. In the third year, El Ashiry was off on a trip to East Asia to stock up on fabrics for her winter collection of loose-fitting jackets and salopettes. “This was not an easy choice to make, because when you invest time and effort in producing something nice, you want to make sure that the fabric is as nice as design. This is not an easy thing to do, because we have an issue with the fabrics in Egypt, not necessarily in terms of quality, although sometimes there is a problem with the quality of dyes used, but at times in terms of the patterns of fabrics,” El Ashiry explained. Eventually, El Ashiry decided that if she were to create her own fashion line and really expand her business, then she would need to make her own fabrics and her own patterns. “Again, not an easy job because I was not planning a mega production scheme. Eventually I found a factory in the Delta that was willing to cooperate with what I needed and I decided I wanted to make my own pattern designs,” she said. This new direction began for the Fayoum collection in the summer of 2018. El Ashiry decided on three simple basic patterns inspired by the pottery, wood and farms of Fayoum. The colours too were inspired by the beauty and art of Fayoum. “For this collection, I would not settle for a regular photo session. 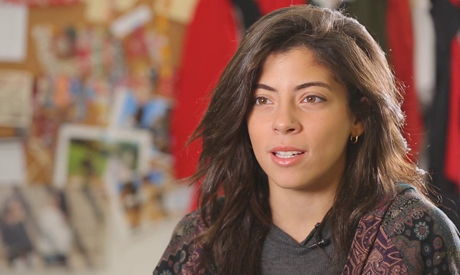 Instead, I made an elaborate video that not only shows my designs, but that also shows the beauty of Fayoum,” she said. Now, El Ashiry is working on producing a limited winter collection. This one would not be of her own-made fabrics though, because she is “not ready yet for the winter textile production." “In any case, I don’t think there is a much room for winter-shopping. We have such a short winter. For me, the top focus is my 2019 spring-summer collection that I hope will also include inexpensive 100 percent made in Egypt swimming suits. It is about time we make our own swimming suits,” she said. Fufa's next summer collection, which should come out early spring, will be inspired either by Nubia or from Siwa. "I am still visiting both places to decide, but there is great inspiration to be found in both places," she concluded.